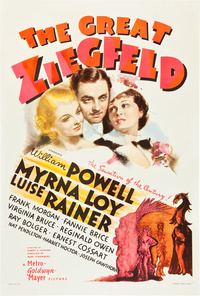 The Great Ziegfeld is a 1936 American musical drama film directed by Robert Z. Leonard and produced by Hunt Stromberg. It stars William Powell as the theatrical impresario Florenz "Flo" Ziegfeld, Jr., Luise Rainer as Anna Held, and Myrna Loy as Billie Burke. The film, shot at MGM Studios in Culver City, California in the fall of 1935, is a fictionalized tribute to Florenz Ziegfeld, Jr. and a cinematic adaption of Broadway's Ziegfeld Follies, with highly elaborate costumes, dances and sets. Many of the performers of the theatrical Ziegfeld Follies were cast in the film as themselves, including Fanny Brice and Harriet Hoctor, and Billie Burke acted as a supervisor for the film. The "A Pretty Girl Is Like a Melody" set alone was reported to have cost US$220,000 (US$}} in dollars), featuring a towering rotating volute of diameter with 175 spiral steps, weighing 100 tons. The music to the film was provided by Walter Donaldson, Irving Berlin, and lyricist Harold Adamson, with choreographed scenes. The extravagant costumes were designed by Adrian, taking some 250 tailors and seamstresses six months to prepare them using of silver sequins and of white ostrich plumes. Over a thousand people were employed in the production of the film, which required 16 reels of film after the cutting. This webpage uses material from the Wikipedia article "The_Great_Ziegfeld" and is licensed under the GNU Free Documentation License. Reality TV World is not responsible for any errors or omissions the Wikipedia article may contain.